Will Specter Litt survive the loss of Mike Ross and Rachel Zane? Has the Suits TV show been cancelled or renewed for a ninth season on USA Network? 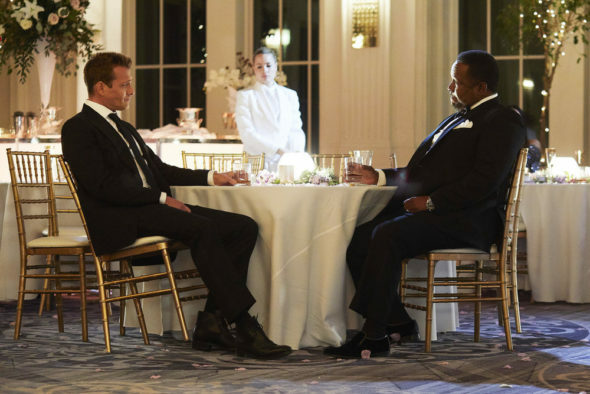 The television vulture is watching all the latest cancellation and renewal news, so this page is the place to track the status of Suits, season nine. Bookmark it, or subscribe for the latest updates. Remember, the television vulture is watching your shows. Are you? A USA Network legal drama, Suits stars Gabriel Macht, Rick Hoffman, Sarah Rafferty, Dulé Hill, Amanda Schull, and Katherine Heigl. After surviving leadership turmoil and the loss of key partners, Harvey Specter (Macht), Louis Litt (Hoffman), and secretary-turned-COO Donna Paulsen (Rafferty) continue to take on big corporate cases, along with Alex Williams (Hill) and Katrina Bennett (Schull). Attorney Samantha Wheeler (Heigl) also joins Specter Litt to fill the void and challenge them to change things up. The eighth season of Suits averaged a 0.24 rating in the 18-49 demographic and 1.02 million viewers. Compared to season seven, that’s down by 29% and 22%, respectively. Check out how Suits stacks up against other USA Network TV shows. Suits has been renewed for a ninth season and final season which will debut TBD. Stay tuned for further updates. Will USA Network cancel or renew Suits for season nine? The ratings are down but I suspect that they are good enough for a ninth season renewal. It remains one of USA’s higher-rated series. For now, I’ll keep an eye on the ratings and update this page with breaking developments. Subscribe for free Suits cancellation or renewal news. 1/23/19 update: Suits has been renewed for a ninth and final season. TV show ratings are still important. Follow Suits‘ weekly ups and downs. What do you think? Are you glad that the Suits TV show has been renewed for a ninth season? How would you feel if USA Network had cancelled this TV series, instead? Yes, very pleased indeed to know Suits has been renewed. One of the best! I just watched the finale for Season 8 of Suits and I loved it. I enjoy every minute of the show and I really hope that we have more of the show to look forward to. Lets face it TV shows and especially shows like Suits are pure entertainment value and I enjoyed the whole of Season 8 because it gave another dimension to the show. Love this show!!! Watched it religiously all these years! Please keep this show going!!! No final season this year! One of the best on tv and love the interaction with all the characters!!! Please leave it on!! I considered no longer watching Suits when Gina Torres (Jessica) moved on from the series, but continued to halfheartedly watch until it was announced that both Patrick J. Adams (Mike) and Meghan, Duchess of Sussex (formerly known as Meghan Markle, Rachel) were leaving as well. I tuned out before their exit even actually happened. It’s time to say good bye to this sinking ship of a once great show. If Katherine Heigl is coming back, I’M NOT. At the end of the finale after Donna & Harvey walked out came a trailer with the opening shot being the words “In 2019”, following by quick shots of scenes never seen this season and clearly showing Luis in charge. Following by another shot with the words “What Could Go Wrong?” Finally freeze photo, used this season with Harvey, Donna & Luis and “Suits 2019”. It sure seemed like the message was that Suits would be back for more episodes next year. Anyone else see that? Or did everyone stop watching after Donna & Harvey exited. Season eight resumes in 2019. Ah! That’s why I keep seeing “Season 8.5”. Thanks for the clarification. I’ll take more Suits however I can get it. This season lost a little of its edge as it tried to adjust to the loss of 2 important characters. But it’s still appointment TV for me. I honestly expected to hate this show w/out Mike Ross— but I actually find it is better this season. Who knew? Bring on another year! Please renew this show for a ninth season. It has become my favorite show. Though I miss the camaraderie of Mike and Harvey; I still think it well worth USA continuing onto a ninth season. Love all the characters and how they interact with one another. Besides, The Donna and Harvey interaction is so enjoyable. I totally agree with everything KDin LA said I’ve now Binge watched all 8 seasons and I’m in withdrawal please, please, please let’s have more !!!! Thumbs down. Katherine Heigl irritates the heck out of me. I seriously miss Mike and the sparkle is just gone.